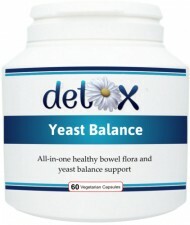 An all-in-one Candida yeast balance, digestion and colon health support supplement. Yeast Balance contains 15 powerful ingredients, including active herbals, probiotics and other natural cleansing and protective agents, which have anti-bacterial, anti-fungal, anti-microbial and anti-inflammatory actions. This supplement helps to support the correct balance of gut micro-flora (bacteria and yeasts), integrity of the gastrointestinal tract and encourages the growth of friendly bacteria (probiotics). Ideal for use in conjunction with a low yeast and low sugar diet. Ingredients: Magnesium Caprylate Powder, Vegetarian Capsule Shell: Hydroxypropyl Methylcellulose (HPMC), Garlic Powder, Anti-caking Agent: Magnesium Stearate (vegetable source), Aloe Vera Extract (200:1), Quercetin Powder, Bifidobacterium Bifidus Powder, Lactobacillus Acidophilus Powder, Clove Bud Powder, Grapefruit Seed Extract (5:1), Thyme Powder, Zinc Citrate, Glucosamine Hydrochloride (vegetable source), Rosemary Leaf Extract (10:1), Beetroot Extract (5:1), Cinnamon Extract (5:1), Oregano Extract (4:1). Contains no: gluten, wheat, lactose, added sugar, additives, artificial colourings or yeast. If taken alone (i.e. rather than as part of a tailored supplements program), the user should start off on a higher intake of 3 - 4 capsules split up throughout the day for 2 - 4 weeks. Thereafter, intake should be reduced to 1 capsule taken 1 - 3 times per day with meals. Can be bought as part of Total Gut Therapy Pack.